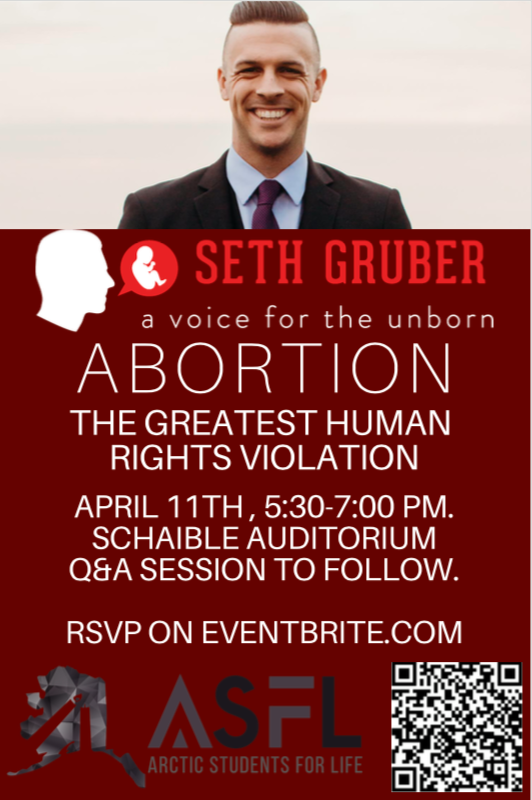 Seth Gruber is a professional public speaker focused on equipping Christians and pro-life advocates to make a gracious, winsome, and persuasive case of their pro-life beliefs in the public square. His approach, while not shying away from the moral question of abortion, focuses on giving Christians the tools they need to effectively and lovingly engage their co-workers, friends, and family members on the issue of abortion. For decades, there has been a crying need in the pro-life movement for speakers who are warm and compassionate, intelligent and articulate about the issue of abortion. Seth Gruber is such a man. Seth has the rare balance of clear thinking with a compassionate heart. If you are looking for a speaker to equip and challenge believers to defend the unborn, Seth will do an outstanding job. Seth Gruber has a passion for defending the unborn that is contagious. He shares his position clearly with grace and truth. Our church greatly benefited from his presentation! Seth knocked it out of the park at our annual fundraising banquet! He was articulate, engaging and related to every age group in attendance. This banquet turned out to be our best fundraiser ever! Seth is a dynamic speaker. He presents arguments for the pro-life position that are difficult to disagree with, but he is also gracious and considerate towards those who have had abortions. He hit one out of the park! Almost EVERY single response card said Seth was the best part of the event. One man wrote that he was pro-choice but that Seth’s presentation changed him to pro-life. Seth is a voice we need to hear for a generation we need to value. Seth’s presentation is clear and compassionate. Help your people hear what matters most. Seth’s message will help tremendously. Have you ever felt overwhelmed by the complexities of the abortion issue? Start your journey here towards becoming a voice for the unborn children in your midst. Seth travels across the country equipping pro-life advocates to be a gracious and persuasive voice for unborn children. Seth speaks in Protestant and Catholic high schools, universities, churches, pro-life training seminars, and for pregnancy resource center banquets. Seth will help train and equip your pro-life organization! Seth will take your team from amateur activists to professional apologists! Seth is available on a contractual basis for ongoing training. Take the weight of training off your shoulders so you can stay focused on your main goal! Thank you for reaching out! I look forward to working together to equip your people to defend the unborn children in our midst! I will be in touch soon. I was 18 years old when I first saw what abortion does to an unborn human being. Though raised in a pro-life family, and the son of a former pregnancy care clinic director, I had never seen the horror that abortion represents. A historic truth, known to all social reformers and abolitionists soon became clear to me: When injustice is hidden, it is tolerated. Sign up to receive free training & resources!